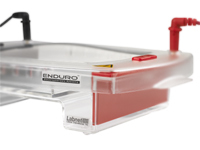 Enduro Horizontal Gel Boxes have been designed for ease of use, safety and durability. A variety of sizes are available, from a mini gel system to a large maxi gel system that can accommodate as many as 450 samples in a single run. 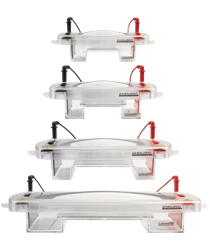 A wide range of accessories are available to customize your system, including multichannel compatible gel combs. EASE OF USE - Casting gels for the Enduro system is very easy. Simply snap the rubber gates onto the ends if the tray, place the comb in position and pour the gel - no taping is necessary. Slots on the sides of the gel trays hold the combs in place. The two piece combs are designed so that the teeth can be raised or lowered to vary the depth of the well within the gel. The supplied combs are 1.5 mm thick. Combs of other thicknesses are available separately. After the gel has hardened, the combs and gates are removed and the gel and tray placed in the gel box. Loading strips may be placed on the bottom of the gel box to aid in well visualization. Gel trays are UV transparent.